Watershed Management Plays a vital role in enhancing Agribusiness . Advances in science and technology has made Agriculture to enter in the era of Sustainable Agriculture. Now time has come to move a step ahead towards Sustainable Agribusiness. 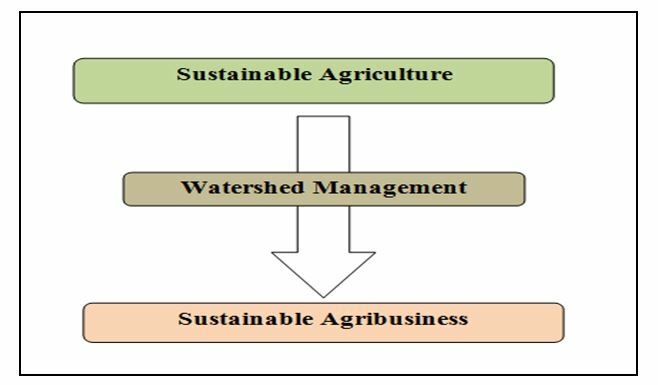 The Watershed Management provides a wider scope for sustainable Agribusiness. Watershed, in itself has integration of many Agriculture and allied sciences. Watershed Programme , creates an opportunity for all favorable conditions for Technical, Physical and financial back up .From Agribusiness point view , it is tough to imagine any other congenial Management condition other than watershed management that can give better thrust to Sustainable Agribusiness .Agribusiness can flourish well under the umbrella of watershed management Watershed management. Various watershed Programme has justified it too. Agri business is off farm activity that infact begin as in farm activity . Watershed management in its process manages the in farm activity and hence give further thrust to off farm activity. That’s how it opens and subsequently widens better avenues in agribusiness. Agribusiness is concerned with making profits in business through agriculture . In farm production of agriculture inputs and its efficient management can cut down the cost of production and hence help in making better profits in Agribusiness .